[ Closed ] One day Profit. ► MT4talk.com → Did you win or lose today? → One day Profit. Hi this is my EA. See only one day profit. Here are the advertising rules! MT4talk PRO members have an option to contact any forum members by email. Nice to see the one day profits, but this seems to be a martingale system building the Lots step by step, can we also see the trades that are towards the downside as they all should be losses . I mean can you show all the trades by using the scroll bar from top to bottom. And if really this could be rinsed and repeated, then You are the Hero man. We all would love to buy it. This user Wajid Hussain is banner to post because broken the forum rules. If you want to send him an email, upgrade to MT4talk PRO! 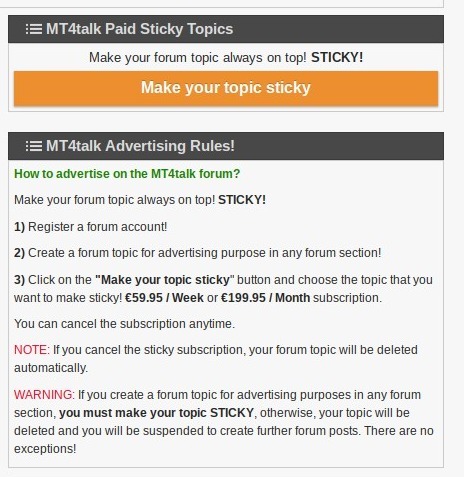 MT4talk PRO members can send an email to any forum members from their profile page.